Exotic treats are not what you commonly expect to find on the candy rack of the local gas station. And though exotic might be a bit lofty when describing Toffifay (known outside the US as Toffifee), its unique nature compared to its store shelf neighbors definitely makes it stand out. I recall first running across this Storck product when I was young. I wasnâ€™t a very big fan back then of toffee (unlike today) and avoided this odd confection at first. But the curious looking box the candies came in intrigued me, particularly the beautiful rendering of the candy on the front of the package that didnâ€™t appear to be toffee-like at all (which itâ€™s not). Imagine my surprise the first time I opened the package. The box is open at the top with paper enveloping all sides. Once you push your thumb through the paper and pop open one side of the box you discover a golden plastic tray hiding inside with four inch-wide cups each containing an individual Toffifay piece. Once you fish out a Toffifay you marvel at its strange shape, an inch-wide bowl of caramel filled to the brim with creamy chocolate hazelnut filling and topped with a generous button-like dollop of chocolate. The secret ingredient that complements this concoction is a whole hazelnut resting within the chocolate hazelnut filling at the bottom of the caramel bowl. The mix of chewy, creamy crunch with the swirl of complementing flavors makes for a delicious treat that easily places amongst my personal top candies. Eating Toffifay is not only a delicious endeavor, but it is also fun! You can eat them straight, forcing the cream and caramel and nut into a mish-mash of flavor and texture that is enjoyed as a whole. Or you can eat through each layer individually, slowly excavating through the chocolate and cream to the hazelnut. 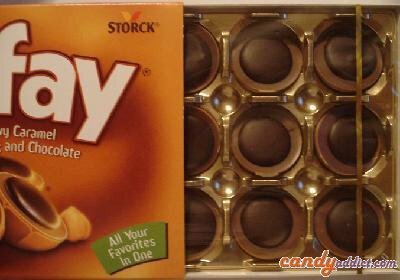 My personal favorite, though, is to place the Toffifay like a dome on my tongue, slowly allowing the chocolate and cream to melt until the hazelnut presents itself. With four Toffifay in a package, itâ€™s easy to practice variety when enjoying this snack. Toffifay is not always easy to find. Many big stores donâ€™t seem to carry it, although Iâ€™ve found one chain of department stores in my area that actually stock the 15 piece box. Itâ€™s not a store I go to often and Toffifay has become my chief purchase there in the past year and my main reason for venturing through their doors. Everything about Toffifay, from its unusual packaging down to its oddly compelling composition and design help it stand out from the candy throng. Topping its mysterious nature is its relative obscurity amongst most people, making Toffifay a rich and rewarding treat for those who are in the know. Nice article and had no idea what to expect when eating this paticular candy. I am not a fanatic on caramel and wouldn’t have tried this candy without first reading this article. I might have missed a delicious treat. Thanks Lance for being so informative! Toffifay is one of my favorites. They are hard to find so almost every time I see them somewhere I pick some up. The problem is, many times they are old. The old ones are too chewy and not right. A fresh box though – YUM! Oh! I love these so much! They’re not too hard to find in Canada either- I may now want to go and pick up a package. I loved these when I was pregnant and kept half my stash in the fridge for a change now and then. Walmart usually carries them. So good. mmm! Thanks – I have always wondered what these were like! I first had this candy when my Dad, who wasn’t big on candy (the only one I can recall seeing him eat was a Heath bar once or twice), gave me some in my Christmas stocking when I was about 12 (I think). I immediately thanked my Mom, who “did” our stockings (oops if anyone was thinking Santa was responsible all this time! ), and when she said, “No, that’s from Dad,” I was stunned! I instantly unwrapped it and was really impressed with the whole thing, especially the packaging: at age 12, I was totally into horses and had some horse figurines – the Toffifay tray made the perfect 4-horse watering trough in my backyard corral and stable that I’d made from whatever I could cobble together! I put one in my mouth and was thrilled! YUM! All kinds of textures, flavors and senses being engaged…I LOVED Toffifay then and now will have to go seek some out since I’ve not had any in a long, long time. I never seem to have noticed that I wasn’t seeing them on candy displays…hmmm…I love a candy challenge! Thanks, Lance, nice job! Oh these look soooo good,. 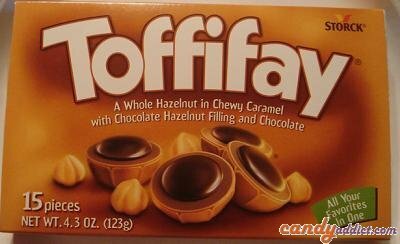 I’m a bit surprised that you hadn’t tried Tofifee yet (yup, I’m from Europe). I picked some of this up today at the local Rite-Aid of all places. I wouldn’t have even noticed it if not for this site. I made myself only get one of the 15 piece boxes and there are only 4 left :( Mahvelous!! To all of you East Coast readers- I just saw Toffifay at my local Shaw’s, in the candy aisle. It was listed as a “new item”, so keep a look out! that’s exactly how I eat them. Funny thing, never thought anyone else would do that. Also interesting it’s somewhat known in the US as well, I thought it was a typical german candy. Currently have a 15pc box and down to 3 pcs :( I need to get some more! Ahh! Does anyone know where I can find Toffifay in the U.S.? Neither the Walmart or RiteAid has it in my location (West Coast) and I’m going to go insane! They don’t spell it that way here, they spell it as ‘Toffifee’. Heh. This is 1 delicious candy! Storck never ceases to amaze me. I can’t share these. I remember eating these when my cousin’s hand popped up in front of my face, asking me if he could have one… I immediately got up and walked away, refusing to share these. Yes, I know, stingy and greedy. But, these are just too hard to share! I mustmustmustmust have this in my refrigerator every week or every month when I decide to give my body a treat after all my exercising. When I was a child I saw Toffifay advertised as ‘the adult candy’, so of course I had to have it. I finally found it somewhere and I’ve loved it ever since. I even bought a huge box in an airport on my way home from London a few years ago. It was expensive, but worth every penny. @Heather – The key is to make sure you get fresh ones – and those are hard to find. I reviewed the Sky Bars and was thoroughly unimpressed. So remember, take a candy review with a grain of salt – just because the reviewer like (or disliked) the candy, it doesn’t mean you will agree. Hopefully the review gave you enough info to make your own decision on whether or not to purchase it. Oh my candy-god, these are the best things I have ever tasted. I.. I… I ate one, and, well, I just… I mean… It was delicious!